The Goetia Spirit Lerie, like so many others seen by the old magickians in years past, appears to have changed his appearance for contemporary times. Instead of "shewing himselfe in the likeness of a galant (handsome) archer, carrieng a bowe and a quiver," as seen by Johann Wier over 500 years ago, Lerie now wears the pall of death. A contemporary sketch of this demon catches a side view of it, clearly showing half of a pale white skeletal mask and a single black eye staring at the ground. 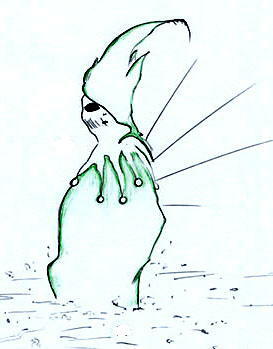 Instead of hunting garb, Lerie is dressed in a long green robe and a type of high-pitched green head ornament. Around his neck is a white decorative adornment with bells, like something a court jester might have worn. Microorganisms swirl at Lerie's feet, giving us some clue as to why this demon is staring at the ground rather than at us. There is something important about the things he is looking at below him. "I am reminded of the genetic manipulation of plant life and curious organisms such as the mold of rye associated with St. Vitus and the 'dance of death.' There is also the image of Christ consuming a similar fungus used within rituals associated with the Oracle of Delphi. I see also biological death associated with human war," the contemporary summoner, Aaron Donahue said. This appears to be a very harsh spirit. According to Wier, Lerie has always had an interest in microorganisms. In his description of the demon, Wier also wrote: "He is author of all battels, he dooth putrifie all such wounds as are made with arrowes by archers." When Lerie was around, the wounds from battle don't heal. Gangrene leading to amputation and or death is suggested. His costume may have changed, but Lerie's interests are still the same. And now he has all of the tools of modern military science to play with. Lerie is the fourteenth Spirit listed in the Goetia. He is said to govern thirty legions of demons.